Here is a nice "Parish of Carrenteel" map from the National Archives in Dublin that I found in the microfilmed Tithe Applotments manuscripts. The tithes were taken in 1827 in Carnteel parish and in 1834 in Aghaloo parish, and the records around this map were dated 1830s. Rev. Edward Stopford (rector of Carnteel parish) was the author of the map. 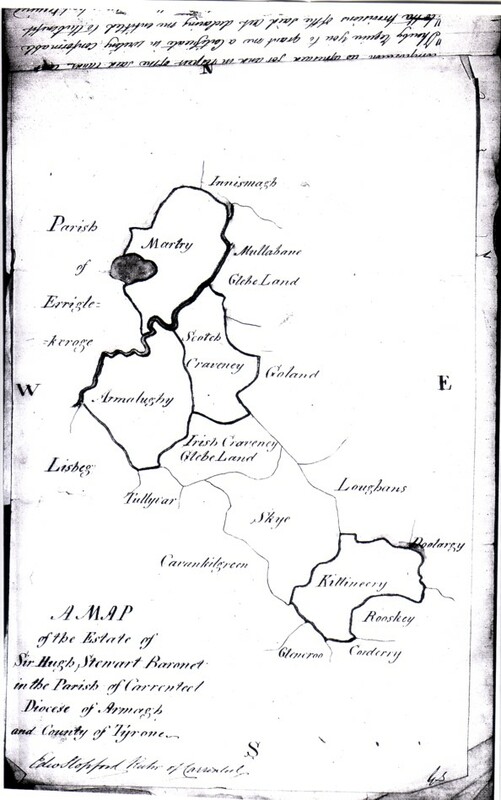 Note that the townlands owned and rented out by Sir Hugh Stewart's estate are outlined in darker ink = Martry (Martray), Armalughy, Scotch Craveney, and Killineery. The large dark irregular oval on left side of Martry townland is Martray Lough, and the dark wavy line southeast of it is the river Blackwater. It's interesting to see the old townland boundaries in southern County Tyrone, and hopefully the map will help some researchers determine who their ancestors' rental landlords were (or were not).